ArduCopter QuadCopter 3DR-C Fully featured UAV development platform. This is the new 3DR Multi Rotor QuadCopter; the ArduCopter 3DR-C frame design incorporates several new features. The landing gear has been moved further apart making the quad more stable during take-off and landings. They also allow a wider unobstructed field of view if you mount a camera beneath the main frame. The centre platform is wider allowing more room to mount electronics in addition to the space in the stack up. Leaving the very top empty to protect the electronics in case of upside down landing. The arms are strong enough to withstand a heavy impact; they also extend past the motors to protect them in a sideways collision. The frame is designed to fit an ArduPilot Mega in any orientation. The sonar mounting bracket fit directly onto this frame. 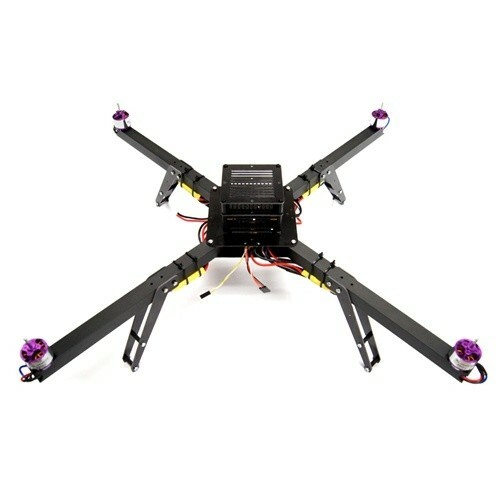 The 3DR-C QuadCopter kit is designed and manufactured at the 3D Robotics headquarters in San Diego, California. The 3DR-C kit has all you need to build the kit and comes with the ArduPilot Mega flight controller included in the price, you only need to add a battery and a RC radio to this system. Assembly instructions in PDF format are here. Due to the fact that this is an open source community project, we can only provide main software development roadmap. This is not a list of what software is capable currently, for current features please check DIYDrones.com and ArduCopter Wiki website. Some of the features needs external device to work, like wireless radio Telemetry Kit. 6 Degree of Freedom IMU stabilized control. Gyro stabilized flight mode enabling acrobatics (loops and barrel rolls). GUI for configuration of PID and other flight parameters. Real-time graphs of flight data. Motor control using low cost standard PWM Electronics Speed Controllers (ESC's). On board flight telemetry data storage. Capability to fly in "+", "x". Capability to fly quad, hexa and octo configurations. User configurable LED flight pattern. Capability to use any R/C receiver. ArduCopter Configuration and Ground Control Software. Wireless command & telemetry for long distance communication. Sonar sensor for automated take-off and landing capability. IR sensor integration for obstacle avoidance. On Screen Display (OSD) integration. Due to the fact that this is a community product, features can change without any notice!